Looking for loose, wavy curls? Walgreens.com has jumbo hair rollers that can help create the look you desire. Roll and snap them into place on wet or dry hair and let time do the work. Hair rollers can give you voluminous waves without hassle and the risk of heat damage. A variety of sizes, materials and hair roller applications are also here. Try a foam roller that is effective and comfortable enough to sleep on. Satin covers come with some foam hair rollers to protect dry or ethnic hair from breakage. Hair rollers can be secured in various ways, including self-holding or self-grip rollers, magnetic rollers and clip holder rollers. Need lush curls in mere minutes? Try hot rollers to help you achieve the style, size and volume of curls you want when you are pressed for time. 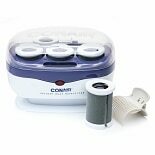 There are fast heating rollers for quick completion, and portable hot roller sets that can travel with you. Hair rollers that heat evenly will provide more satisfying results, while quick-heating curlers can allow you to finish in minutes. Hair hot roller features can also include cool-touch ends, ceramic rollers for even heat, ionic rollers for less frizz and more shine, and grips that provide a secure set. Most heated roller sets come with varying sizes so you have options for the size of your curls.